If you’re like most people, wanting to make changes and updates to your home often accompanies the New Year. As you consider the changes you want to make to your home, you’re probably looking for ways to make the biggest impact for the least amount of money. 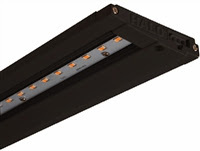 One of our favorite, most affordable ways to make a big change around the house is with undercabinet lighting, and these black LED undercabinet lights from Halo are an excellent option for helping you take the most advantage of your cabinet space. Compared to halogen undercounter lights, these LED undercounter lights offer an 88 percent energy savings, which adds up to $510 in total savings over the life of the fixture. Although the fixture comes with a five-year warranty, these fixtures are known to last for up to 22 years! At only ¾” tall, the low-profile design of these lights makes them ideal for lighting up the space in your cabinets without taking up valuable storage room. These lights come in three different lengths — 12 inches, 18 inches and 24 inches — as well, so you can choose the size that fits your cabinets best without having to resort to a customized option. This innovative design also allows you to connect any combination of fixtures up to an 800W total load, making it especially easy to provide lighting to each of the cabinets in your kitchen, office or workspace. In addition to its integral on/off switch, we love that this fixture is fully dimmable with a wall switch. To ensure you choose the right dimmer for the fixture, we recommend this dimmer from Lutron. Dimming provides energy savings as well as the ability to choose the perfect amount of light for any task or mood. What home improvements are on the top of your list for 2015? Let us know in the comments below!